Assignment 9 of the Society of Botanical Artists Distance Learning Diploma was entitled ‘Working in the Field’. For this assignment we were asked to find a location we liked, any natural habitat, and study, record and illustrate the species that were present. I deliberated for a long time about my location of choice! Eventually I chose a spot in the village of Preston in Kent where they had the most amazing display of bluebells. I took my Jack Russel Lily along for company which turned out to be a mistake as she was nothing but a distraction…! I found working in the field really difficult, but enjoyable at the same time. I missed the comfort of a desk to lean on, bugs kept landing on my page and somehow I’d accidently squish them and end up with bug sauce all over my paper…! I didn’t want to pick the flowers as it’s a nature reserve, so I was rolling around the ground at all sorts of angles to try and study each flower, and I kept dropping pencils/rubbers/rulers on the ground and spending a good while searching for them on the woodland floor! Those obstacles aside, I love being outdoors, and sometimes the endless hours of painting inside at a desk does leave me craving sunshine, fresh air and exercise! 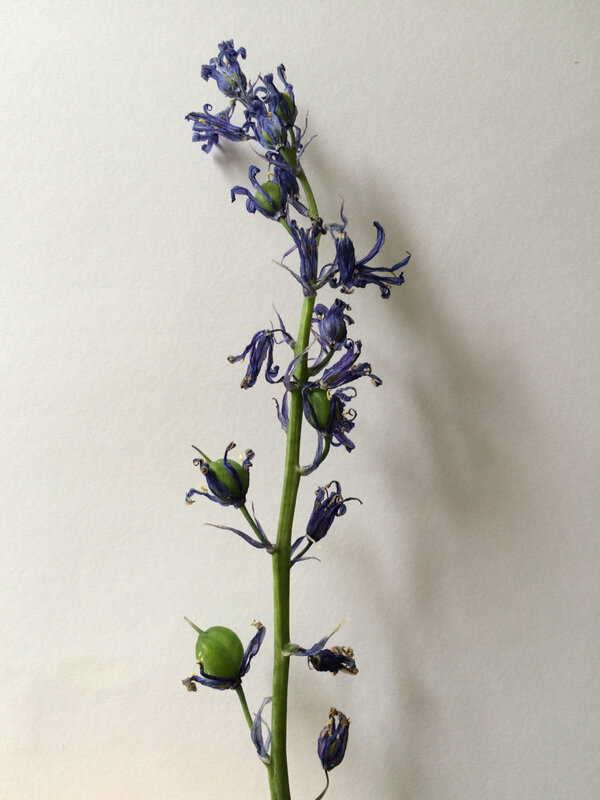 You’ll see in the photos above that there is a drawing of a drying bluebell. I reallywanted to paint this, as I thought it was such a beautiful specimen, but unfortunately I ran out of time and I had to leave it out of the composition. Here are some photos of this assignment in progress. I didn’t have quite enough time to give the painting the level of detail I would have liked. As a result my image had quite a stylised feel about it, which my tutor did pick up on. For example, the bramble leaves below, I didn’t get the opportunity to paint in the finer veins, only the main veins. I really enjoyed painting the bluebell, it’s definitely a subject I’d like to paint again. You can see the bluebell ended up with the same styleized look as the bramble and fern. I found the earthy tones in the calyxes of the red campion difficult to master! In general the feedback on this painting was quite good, but I let myself down a lot with the sketchbook pages we were asked to submit. I submitted the pages from my work in the field, with no refinement at home, so they were definitely not to the best standard. My tutor picked up on the fact that this piece of work was painted quite stylised, which I agree with. He thought my tone and form were good, but that the tones were quite similar throughout – for example the bramble leaves at the bottom have the same light direction as those at the top. I had this really romantic picture of what ‘working in the field’ would be like. Sat in the woodland, sketching, painting… but in reality I found being away from my home comforts really difficult. I have a lot of respect for artists who spend most of their time in the field, and it’s something I would definitely like to expose myself to more, and practice. Also a tip for this type of work – don’t underestimate the amount of time it takes, and the value of getting really detailed and thorough drawings of the specimens. The next assignment is almost the direct opposite in terms of a botanical artists working style – working from photographs! Thanks for reading, I hope it was a useful read, particularly for students currently on the SBA diploma.